A team of eight people traveled to Spain in July to help Pastor Fernando and the church of Iglesia Esperanza De Vida reach out to the community. Although the church only has about 35-40 members, they are working to spread the Gospel and plant two new churches in the region. During the day, the team split up to lead a basketball camp for children or prayer walk around the community. In the evenings, they spent time in fellowship with the locals after a Bible study at the church by missionary Jim Thurber. 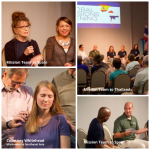 The Chapel is partnering with International Cooperating Ministries (ICM) to help bring the Gospel and plant churches in Thailand. The country is heavily influenced by Buddhism and Animism. It’s estimated that only 5% of the population has heard the Gospel and less than .5% are considered Evangelical Christian. In September, a team from the Chapel went to visit the Village of Hope, a Christian orphanage and school led by Prautan and Gik, a husband and wife team. Their efforts are protecting children from human trafficking by keeping them in school and away from traffickers coming up from Southern Thailand. The highlight of the Thailand trip was seeing the baptism of over 50 children who had accepted Christ. As children were baptized one by one in a stream, other children stood on the bank singing I Have Decided to Follow Jesus. It’s a moment the team will never forget.